Cuban-Canadian Grammy nominee teams up with Cuban legend for a tribute to a Trova icon. 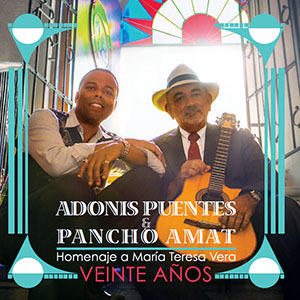 Adonis Puentes and Pancho Amat release Veinte Años: Homenaje a María Teresa Vera on November 17, 2014. Free show: at the Waterfall Stage, First Canadian Place, downtown Toronto, on November 18 at 12:15pm. Album launch concert: Wednesday November 19, 2014 at Mundial Festival in Montréal, Québec. Grammy-nominated Cuban-Canadian sonero Adonis Puentes and legendary Cuban tresero Pancho Amat pay homage to one of the most iconic figures in the Afro-Cuban diaspora, María Teresa Vera, with a new album named for her seminal composition, “Veinte Años” (Twenty Years). The album, which has already been nominated for a Cubadisco award, the Cuban Grammy, is a duet between Puentes on vocals and Amat on tres. Along with a full backing band of hot Cuban players – including Amat’s son, Daniel, on piano – they recreate Vera’s work with a mixture of reverence and authenticity, and nods to contemporary Cuban tastes. María Teresa Vera, who was born in 1895 and died in 1965 at the age of 70, was one of her country’s greatest twentieth century trovadores — itinerant musicians who performed their own compositions throughout eastern Cuba, accompanying themselves on guitar. Puentes and Amat’s tribute features twelve outstanding tracks, half of which were written by Vera, the other half performed by her. It’s been released on the Cuban Institute of Music’s Colibri label. The trova style Puentes celebrates on the album bares striking similarity to the original compositions on which he’s built a reputation since arriving in Canada 16 years ago. Born in the colonial city of Artemisa, southwest of Havana, Puentes and his fraternal twin brother, who performs as Alex Cuba, were schooled in music by their guitarist and music professor father Valentin. Both toured with their dad as youth before settling in Canada as young adults and earning a Juno nomination together as the Puentes Brothers. Since embarking on his solar career, Adonis has gone on to global acclaim as a Sonero, singing ballads backed by the mix of Spanish guitars with African rhythms specific to Cuba. He garnered a Grammy nomination for his lead vocal work with the nine-piece, L.A.-based Mongorama, directed by well-known radio host Jose Rizo. He has toured with Irakere veteran Orlando “Maraca” Valle and sung at L.A.’s Greek Theater and Hollywood & Highland. He’s also performed at New York’s Lincoln Center, where he shared the stage with Latin music luminaries Larry Harlow and Rubén Blades before 24,000 fans. In addition, he has performed at festivals around the world from SXSW in Austin, Texas to Java Jazz in Jakarta, Indonesia. 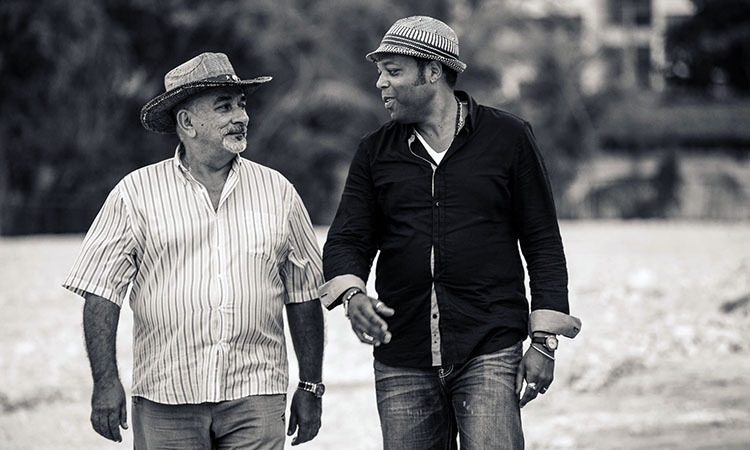 With the release of Veinte Años, Adonis Puentes and Pancho Amat have effectively revived the trova tradition for a new and more widespread generation of lovers of Afro-Cuban music.